When I first covered Pixlr Express a few days ago, I noted that the presence of a photo editing app was odd in Autodesk's lineup of powerful tools. Having developed apps like ForceEffect, 360 Mobile, and AutoCAD WS, you'd think Autodesk was marketing to power users who want to design, edit, animate, and engineer from the palm of their hand. Still, Autodesk's first foray into the mobile photo editing world – Pixlr-o-matic – was a hit. 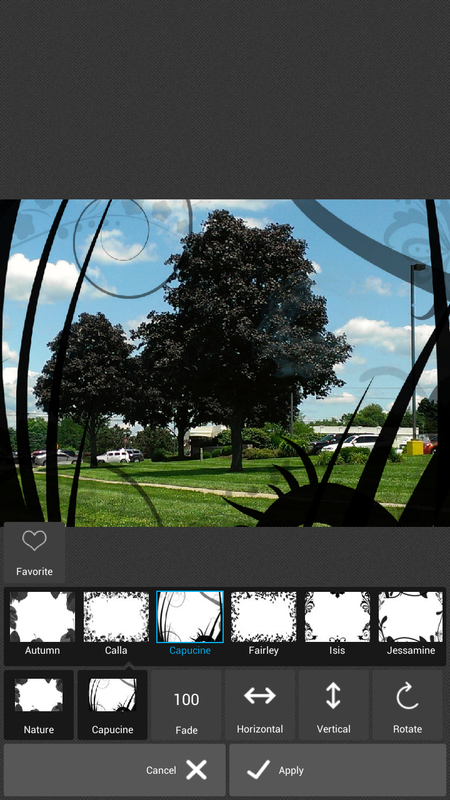 So much so, it appears, that Autodesk brought to market Pixlr Express. Despite its name, the only thing "express" about Autodesk's new tool is the speed with which users can edit, manipulate, and overlay photos using a wide library of tools (when I say "wide," I refer to its selection of 600+ effects). Its functionality is not as retouch-oriented as, say, PhotoShop Touch, but it is much more complex than other on-the-go editors like Instagram or even Autodesk's own Pixlr-o-matic. Personally, I don't have much use for photo overlays or dramatic vintage effects, and for most of my on-the-go photo editing, I enjoy Android's built-in editing options (especially in 4.2), but past that, Pixlr Express actually offers a lot of quick editing functions that Android doesn't, which – in my book – makes it pretty handy. Let's take a closer look. Using Pixlr Express is about as easy as it gets – the startup screen lets you choose whether to take a new photo or edit an existing image, and has a short settings menu for adjusting backend functionality. 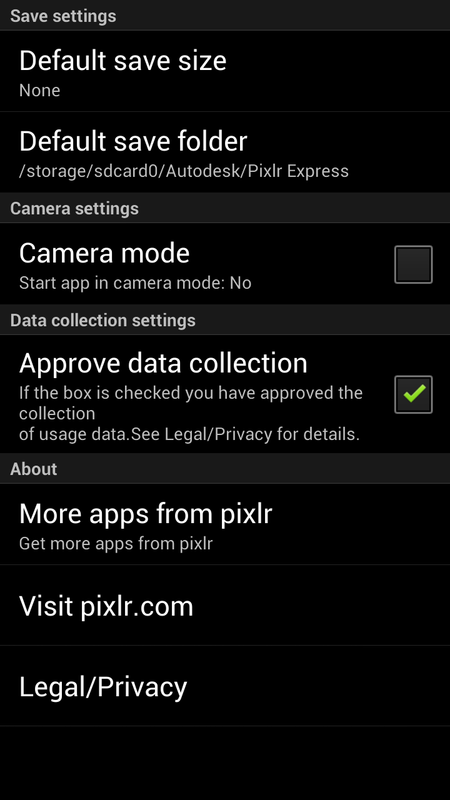 You can even have the app start up as a camera. 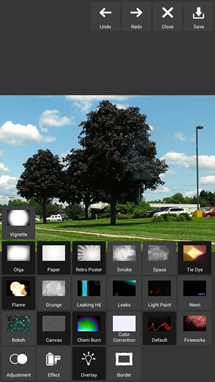 Once inside the editing interface, every option is a simple, clickable square. Sometimes you'll get more squares that smoothly glide out of the background, other times you'll have adjustment sliders that do just what you'd think. 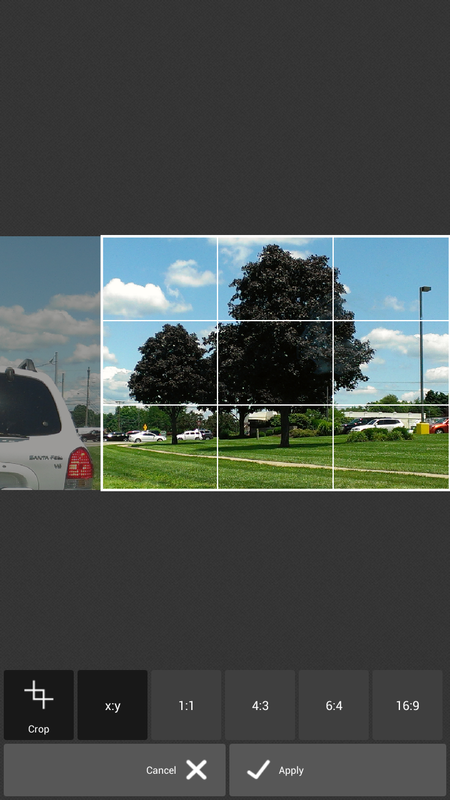 "Adjustment" is the tile under which all the real photo editing action happens. Users can do things like sharpen, remove noise, fix red eye, whiten teeth, 'touch up' (which is somewhat similar to Photoshop's spot heal), do creative tilt/shift blur, crop, and a ton more. The selection, which is itself impressive, is especially great because all of the functions can be executed in seconds. Again, the app's interface is incredibly simple, so there's not too much to talk about in that regard – just click the tile you want, make any adjustments you see fit, and hit "apply" or "cancel". If Pixlr Express' selection of adjustments is strong, its selection of manipulation effects is simply crazy. For the sake of word economy, I'll lump three of Pixlr's categories into the "Effects" heading – Effect, Overlay, and Border. Effect is just what it sounds like – this is where you'll find your vintage/hipster filters. 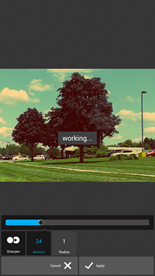 It's a section reminiscent of Instagram, except that Instagram's selection can't hold a candle to that of Pixlr. Once you choose an overarching effect category (like "Default," or "Subtle") you'll see a list of variations, all named after people for easy recognition. 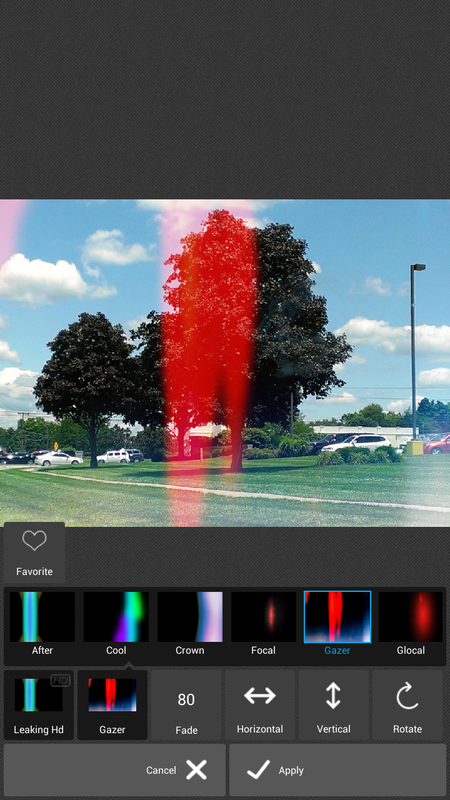 Then again, you can always remember your favorite effects by adding them to your – you guessed it – Favorite list. Each effect also has its own adjustment slider, so you can make your image as bold or as subtly filtered as you wish. 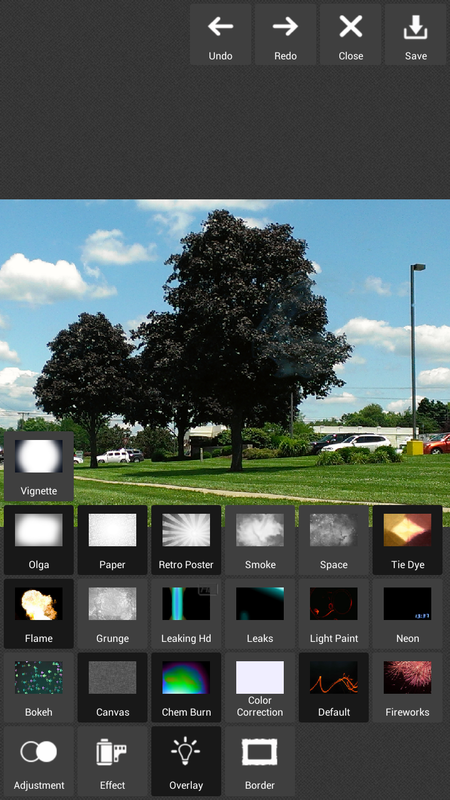 Overlays, likewise, are just what their name implies. Some of these (like leaking) could better fit into the "effect" category, but most of them are true overlays – some of them, like vignette, are pretty standard. Others, like Tie Dye, Retro Poster, etc., are unique and really pretty cool. 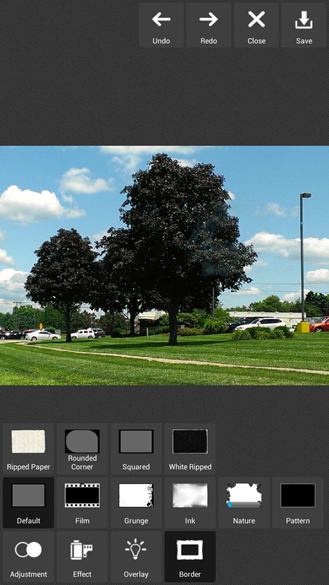 With great overlays, however, come great responsibilities. It's really easy to go overboard with these effects. 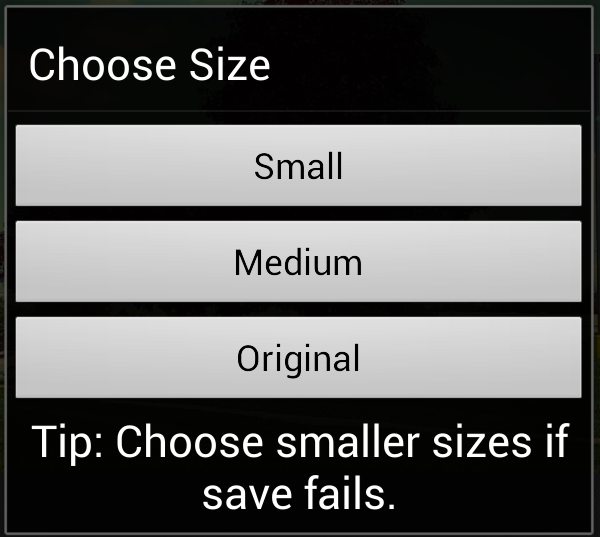 Once you choose an effect, though, you can select from a slew of variations, and adjust them just like with the effects. Pixlr even allows rotating, flipping, and fading of effects, again allowing for almost infinite possibilities. Finally, we come to Border. This, again, offers a ton of options – an overarching tier of border categories, subgroups of those categories, and then individual variations on the theme. Really, the borders are the icing on the Pixlr cake. You've got some adjustments, maybe an overlay or two, and the border selection offers what you need to either push your highly processed photo over the top, or just add a subtle touch. The borders, like everything else, can be adjusted, flipped, and rotated. 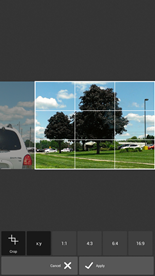 If you're looking to do more than just save your freshly edited photos, you can share them using any sharing method you have installed, from Bluetooth to e-mail, Facebook, and – of course – Instagram. 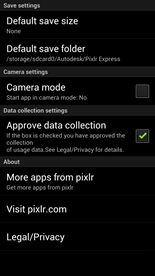 What makes sharing better with Pixlr Express though, is the fact that the app allows you to choose what size the file will be saved at – small, medium, or large. While it isn't a full fledged compression menu as seen in Photoshop, it's a great touch. 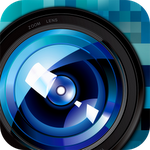 Pixlr Express' sharing capabilities, in this writer's opinion, pretty much relegate the role of apps like Instagram to that of a pass-through for the social network. 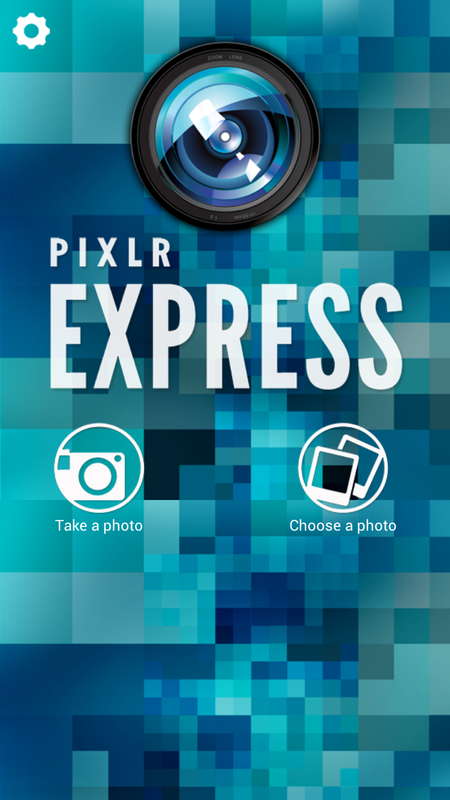 If you're looking for an app that will allow you to do a lot, a little, or anything in between to your photos in seconds, your solution is here in Pixlr Express. For heavier editing of bigger images, you'll want a more powerful tool, but if you just want a few tweaks, or if you're a member of the Instagram crowd, Pixlr Express beats the pants off any filter/overlay photo app I've yet used. All that, and it's free on the Play Store. Check it out by hitting the widget below.